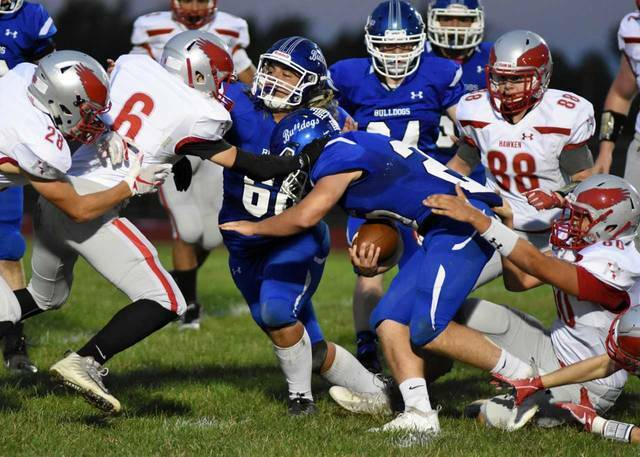 CRESTLINE — After winning their week one contest against the Buckeye Central Bucks, the Crestline Bulldogs football squad dropped their next three contests entering week five action at home against the visiting Gates Mills Hawken Hawks on Friday, September 21. 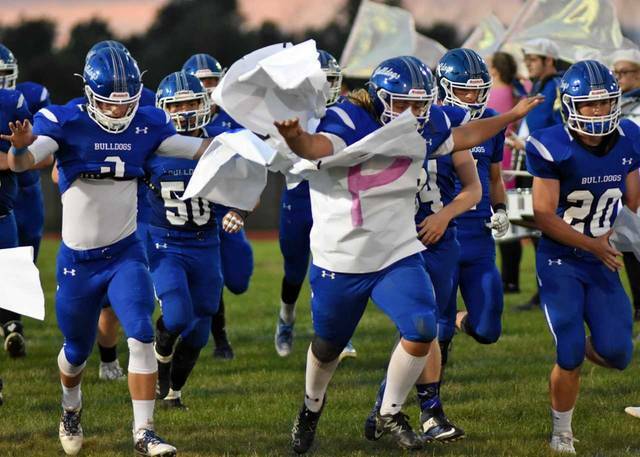 Crestline appeared to get back on the right path as they marched to a lopsided, 59-7 victory over their visitors to move to 2-3 overall in 2018. The Bulldogs will head to Lucas on Friday, September 28 for a clash with the hosting Cubs. The home team got on the scoreboard early and often against the Hawks, starting with a one-yard touchdown scamper by running back Dakota Wireman. Despite the missed extra-point attempt be kicker Logan Parrella, Crestline was off and running; 6-0. Later on in the opening quarter, Ty Clark connected with Jaxson France for a 41-yard aerial touchdown and with the added two-point conversion, the ‘Dogs found themselves up 14-0. Crestline was not finished in the first frame though as Clark found wideout Kaden Ronk for a 44-yard touchdown and with the added Parrella PAT, the ‘Dogs were up 21-0 after the first 12 minutes of action. In the second quarter, Crestine picked up right where they left off as Caleb Moore found the endzone on a one-yard run to put even more distance between the home team and their visitors; 27-0. Ethan Clum would get in on the scoring brigade as well in the second, punching in a touchdown from 11 yards out to make it 33-0 in favor of the ‘Dogs. Later in the second, Clark and Ronk would team up again for a score, this time from 20-yards out and with Parrella’s extra-point, it was 40-0 Bulldogs. Before the intermission, Clark would find Ronk for his third touchdown catch of the contest, a nine-yard connection and after the PAT, Crestline headed to the locker room with a massive, 47-0 advantage. With the running clock rule in effect to begin the second half, the hosting Bulldogs would prove that their offensive onslaught was far from finished as Clark found France for the second time on a 28-yard strike to move the score to 53-0. It would be the defense that would tally Crestline’s final score on the evening as Parrella scooped up a fumble by Hawken and turn it into a 14-yard score. Parrella proceeded to boot through the extra-point and it was all Crestline; 59-0 heading into the final frame. Gates Mills Hawken finally managed to find the scoreboard in the final 12-minute period, scoring on a 25-yard touchdown run and converting the extra-point to spoil the ‘Dogs shutout and put the score at its eventual final of 59-7. Clark finished the game with 222 passing yards on 12/17 attempts that led to five touchdowns for the home team. Ronk had himself a game, catching four passes for 94 yards, three of which were touchdowns. France caught three passes for 87 yards and two scores. On the ground, Moore finished with 43 yards on seven carries and a TD while Wireman posted similar figures, carrying the ball six times for 43 yards and a score. Enyce Sewell carried the ball four times for 38 yards, Clum finished with 30 yards on seven attempts and Santho Owens had six yards on two carries to round out the rushing attack for the ‘Dogs. Other statistics for Crestline in the win were: Team- 9 tackles for a loss, 5 sacks; Perrella- 2 sacks, 3 TFL; Andrew Gundrum, Tommy Hale and Austin Harrod- 1 sack, 1 TFL apiece; Calvin Reed, Ethan Clark and Ronk- 1 TFL apiece; Austin Silverwood- 1 catch, 17 yards; Moore- 1 catch, 3 yards and Owens- 1 catch, 3 yards.